Below are some of the important questions that we get asked occasionally. If you can’t find the answer to your question, please don’t hesitate to get in touch with us directly or to challenge our community on the forum. Can I access my Data after an Event? Since this is an online application, updates will be applied automatically so you are always running the latest version. The invitation from the Host to the participants for the Event can be sent out from the market dojo system. Alternatively the Host can send the invite out to the participants using their own e-mail system or via a phone call by referencing the invitation code. When all parties are registered, it may be easier to use the integrated online Message Board for the Host and participant to communicate directly without the need to use an external e-mail system. This is essential when the Event is actually running due to the speed of communication required.Contact details are provided throughout the software for participants and Hosts to contact each other directly by e-mail or via the phone. Are the bids legally binding? All bids placed are legally binding. The duration that these prices will be held for should be specified in the ‘Request for Participation’ document. Please see our guides on this. What can you negotiate online? Indirect Commodities: Office Supplies & Equipment, IT Hardware, Software & Maintenance, Printing Services & Materials, Temporary Labour, Landlines, Mobile Phone contracts, Envelopes & Paper, Transport & Logistics (Land, Air and Sea Freight, Newspaper & Leaflet Distribution…), Couriers & Postage, Utilities & Raw Fuels (Gas, Electricity, Diesel, Coal…), Packaging, Cabling & Electrical Connectors, Electrical Components, Factory Consumables, Uniforms & PPE , Conveyors, Insurance, and many others. Direct Commodities: Both Scrap and Virgin Raw Materials (Plastics, Metals, Ceramics, Timber, Cardboard…), Machined Parts, Sand Castings, Forgings, Injection Mouldings, Blow Mouldings, Thermoformed Pots, Foil Lids, Die Castings, Pressed Parts, Cold-Formed Parts, Fasteners, ATMSafes, Chemicals, Printed Circuit Board Assemblies, Wire Harnesses, LEDAssemblies, Stone Crusher Jaws & Mantles, Seals & Gaskets, Food Stuff (Rice, Tomato Powder, Cous Cous, Strawberries, Black Cherries…), Fabrics & Leather, Automotive Components (Mirror Heads, Seat Covers, Tyres, Sirens, Brake Drums, Brake Pads…), and many others. Services: Lawn Mowing, Road Sweeping, Laser Cutting, Car Rental & Leasing, Mail Fulfillment, Electrical Contracting, Building Services, Facilities Management Services, Electrical Design Services, and so on. Miscellaneous: Property, Antiques, Jewellery & Precious Metals, Gas Turbines, Football Tickets, Art, Used Machinery & Equipment, Warehousing, Capital Projects and so on.If you are ever in any doubt as to whether a particular category or item of yours is suitable for an Online Negotiation Event, please read our guides and also contact us so we can give you our honest opinion. Where does the name market dojo come from? We have tried to find a name which suits the activity. During the process of setting up an Event, you will analyse and go out to ‘ market’. The Online Negotiation Event happens in a private marketplace and we help you find the market price. The market is central to the activity, hence the first part of our name. The second part is more lateral. Dojo is commonly known in the western world as a ‘training place’ or ‘exercise hall’. market dojo is certainly a place where you embark on training before an encounter and it promotes a competitive focus. However, in Japanese, Dojo literally means ‘place of the way’ or ‘sacred hall of learning’. We certainly aim to enable you to find your way to market and to learn a few things during the journey.One final meaning is a ‘place of enlightenment’ although we leave this opinion for you to judge! The Online Negotiation Event with market dojo is only open to the participants whom the Host would like to include. The Event is completely hidden from anyone who has not been invited. Therefore it is the opposite to an open market, such as eBay, which lacks this level of professionalism. What is a Qualification Bid? The Qualification Bid is the price level at which a participant is able to have their bid accepted for any Lot in the Online Negotiation Event. Think of it as a reserve price if you like. However, a key difference between a reserve price and the qualification price is that with a reserve price your bid is accepted but you get the feedback that your price level is insufficient for you to be successful, whereas with the qualification bid your bid is not accepted until you meet or surpass the qualification price level. In both cases, it is rare for the participant to know or be informed of the actual value of the reserve or qualification price levels. The reason we use a qualification bid rather than a reserve price is that a participant can submit a reserve price that is accepted by the system and can lead to no further bid revisions being made. This, in turn, can lead to the participant not being considered by the Host. With a Qualification Bid, the participant gets instant feedback as to whether or not they are successful in contention for the Event item, product or service. At the same time, the Hosts can use the Qualification Bids to enhance the likelihood of success in the Event by achieving a target price for the Event Lots before the Online Negotiation has even started. Please note that it is not mandatory to select a Qualification Bid. The Lots can be left completely open whereby any bid is accepted provided each participant improves on their own previously submitted bid. A Lot refers to a collection of goods or services which the Host would like the participants to bid upon. An Event can be made up of one or more lots. Quantity: This is the quantity that is associated with the UoM. It might be an annual quantity or it could be a one-off quantity. Either way, it is up to the Host to specify this value. Qualification price for the UoM: This is a price that a Host may set which the participants need to better for their bids to be accepted. Current price of UoM: This represents the current price that you are paying for the UoM or estimate it to be. This will be used to work out the net savings from the Event in the case of a reverse auction or your estimated gain from a forward auction. A participant is a company or individual who wishes to bid on an Online Negotiation Event. Participants do not have to pay to take part in an Online Negotiation Event as we believe this will affect the Host’s ability to find the true market price. A Host is the person representing the company running and managing the Online Negotiation Event and is looking to buy or sell particular goods or services. The Host will have paid to use the software and will be the person responsible for creating the Event, inviting participants and creating and uploading specifications. The participants should approach the Host with any questions relating to the Event. What other terminology is used instead of online negotiation event? We have heard Online Negotiation Events called many things before in our time. Here are a handful of alternative terms that you may be familiar with, many of which have the same meaning and ideology to what we offer here at market dojo : Online Auctions, Reverse Auctions, Forward Auctions, Dutch Auctions, English Auctions, Japanese Auctions, e-Auctions, e-RFQ, e-RFX, Online Bidding Events, Procurement Auctions, Sourcing Events, Strategic Sourcing Events, e-Sourcing, eRA, e-Procurement, and so on. We’ve stuck to Online Negotiation Events as we hope that aptly describes what is going on! What is an online negotiation event? An Online Negotiation Event is a method of negotiating a price agreement between a host and multiple participants through online software in order to identify the successful participant(s) to transact business with. The participants compete with each other in real time by using the feedback from the software to assess whether or not to adjust their price offering for the Event items, be it a supply contract, a service, a product or item. Think of eBay except in a professional and closed market environment where you can run both forward and reverse auctions. The host is fully in control of who is involved in the bidding, with full traceability of the communication and document downloads. It is widely regarded as an efficient way to settle the price negotiation compared to say a traditional face-to-face approach. In today’s global market it is certainly extremely convenient in many ways, for example overcoming language barriers, different time-zones and long distances, as it is all online for 24/7 remote access. market dojo is a UK-based procurement software company. We provide Online Negotiation software that helps businesses globally to efficiently negotiate the true market price for their goods and services. The platform offers advice on the best practice for online negotiation to maintain professionalism, supplier confidence and ensure that you will achieve success. What if I want to share my Event with someone? Within our Admin menu for the ‘Superhost’, that is the first Host to register for a particular company, you will find the User Hierarchy feature. Here you can add other Hosts and give them rights to view or edit others Hosts’ events. You can even assign others with Admin rights to look after things like your Participant Database. There’s no cost on adding others to view your events and you can add as many users as you wish. What if I am ill during the Event? As a Host, if you are ill during the event, it will still go ahead. If you are not able to change the start date then the best solution is to have someone else within your company monitor the Event.As a participant, if you are ill during an Event, the Event will most likely go ahead unless you can convince the Host to delay proceedings. If you are not able to delay the Event then the best course of action is to let someone else with your company participate but you need to let them know their boundaries! Can I give my log-in details to someone else? Your log-in details are confidential and should not be shared with anyone [exception below if you are ill]. If someone else from your company would like to Host or participate in an Event, then they would need to register and generate their own username and password. However, since an Event, whether you’re hosting or participating, is tied to a user, they would not be able to see the Event even if they log in from the same company. However, as a Host, you can give other Hosts permission to view or even edit your event(s) if you wish, by using our User Hierarchy feature (see ‘What if I want to share my Event with someone?’ below). Can I use market dojo if I don’t have the internet? Unfortunately, we don’t have an offline version available at this time. We may develop this in the future if there is demand but the Online Negotiation Event itself will always require the internet. What if the internet goes down during the Event? We have specifically designed this software to be used online. It is the only realistic method of enabling a real-time bidding activity. With internet availability being increasingly accessible in the office, at home, in coffee shops there are normally alternative ways for getting online. As you create an Event, your settings are automatically saved as you progress and our data is backed up regularly on secure servers. However, if your internet connection goes down, the service will be affected and you will need to find an alternative connection method. If you are a Host and this happens, the Event will still be running on our servers but you will not be able to see the status until you log on again. If you are a participant and you cannot get back online and an Event is in progress, then you would best to call the Host directly and to offer them your best bid. If our server goes down (the chance of this happening is extremely small) then it will more than likely to be up and running within a few minutes. If the server (and its backup) fails during an Event and it is not up and running by the end of the Event then the most likely scenario would be to run the Event again from the last position attained. This has never happened yet in our experience. Why do you use a credit system? The credits model is to give us and our clients flexibility. What we offer is a solution that caters for 90% of the e-auction market as standard, but with modular functionality to satisfy the remaining 10% of users, for example having bespoke categorised participant databases or using advanced reporting. Our clients can expend credits to add such functionality to their account, if they so choose, and can make this choice once their experience and requirements develop, i.e. once they feel comfortable. Credits also allow clients to consolidate their purchasing and invoicing transactions and allow them to continue to use their account uninterrupted. This works in the same way as something like ICIS LOR, the plastics and chemicals market price database. Credits can be purchased in bulk by our clients to be used how they want when they want. For us, the credit system is an advantage because the consolidated invoicing also aids our cash flow. Furthermore, the credits allow us to carry out some great marketing initiatives. Do Online Negotiation Events adversely affect the relationship with my incumbent? There are many myths surrounding Online negotiation Events and this is one of them. In our experience, these Events, if run properly, will not damage any relationships. In fact, if they are run in an open and honest way (using our guides for support) they can actually strengthen relationships. This is achieved though the upfront flow of information, the organised approach, communication and the higher level of feedback that can be obtained from an Online Negotiation Event.Please see our guide titled ‘Myths of Online Negotiation Events’ for more information on this subject. What happens if, during the course of the activity, we find it is not suitable to progress to the Online Negotiation? If you have a Full Licence, this is not an issue as you can run as many activities as your desire. You should simply communicate your intentions to the participants and continue down that new path.However, if this happens on a Pay As You Host Licence, the market dojo team can offer advice to remedy the situation. Can someone make a last second bid to win the Event? These are professional Events where the goal is the find the market price. ‘Sniping’, where last minute bids are placed, will normally only infuriate participants because it will not give them time to react. This is why we have the feature called ‘Automatic Time Extension’ which can be enabled to prevent exactly this. See the FAQ above, ‘How long should an Event last?’. How many participants can I involve? There are no limits to how many participants you can invite. 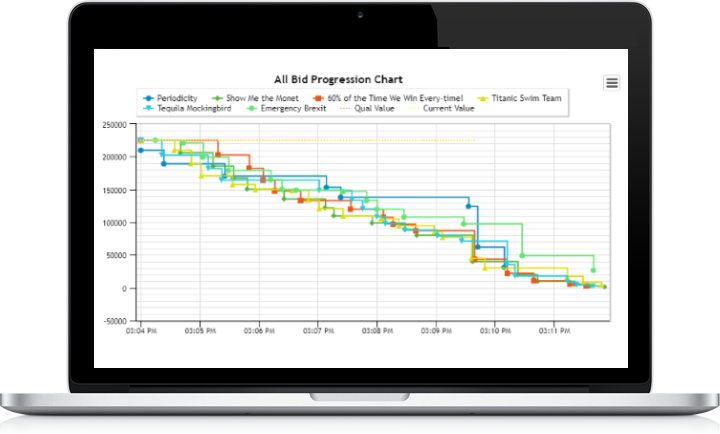 The higher the number of bidding participants, the more chance you will have of success. Our recommendation is to have five or more participants and certainly no fewer than three. How do I invite participants to take part in my Event? Participants can be invited by two methods.The first and most simple method is through our online software. The last part of the Event Creation is the Invite Participants section. Here you will be able to enter the e-mail addresses of the participants you would like to invite. The system will then send them an e-mail to invite them to the Event.The second method is via your own methods. Whilst you follow the steps of the Event Creation, you will be given an Invite Code. You can communicate this code to your potential participants via the phone, fax, e-mail or whichever method you desire. The participant will just need to register and enter the code in order to see your invitation to the Event.In either instance, the market dojo software will track the invites to your Event so that you can see which participants have responded to your invite and which have not so that you can follow up accordingly. Can I create an Event based on a unit price or must it be the total value? b) Make the UoM ‘500 tonnes’ and the quantity ‘1’. The participants are then bidding directly on the total Lot value of 500 tonnes. This can offer an advantage if your Lot consists of many items of different prices, whereby one unit price cannot apply. A Lot full of stationery items is one such example (pens, paper, ink cartridges and so on). Once the negotiation on the Lot value is complete, you would then request the prices of each item within the Lot, ensuring that the individual prices come to the same total as the negotiated Lot value. How long should an Event last? Typically an Event will last about 30 minutes. Automatic Time Extension can make an Event last a couple of hours (Automatic Time Extension is a feature which means that if a bid is placed in the last X minutes, then the Event is reset to X minutes remaining).If the Event contains many Lots, has a large number of participants, or crosses several time zones then you can set the Event to last sufficiently long. What format of Events can I run? You can run both Forward and Reverse Auctions. A Forward Auction is where a Host will be selling and the participant’s bids must always go up. A Reverse Auction is where the Host is buying and the participant’s prices will always go down.The Events can also be either ‘Ranked’ or ‘Open’. In a Ranked Event, the participants will only see their bid and their position relative to other participants. In an Open Event, the participants will see the current winning bid but not who placed it. Can one Full Licence be used for many users? Each Full Licence is tied to one specific user. If you have a requirement for multiple Full Licences for multiple users, either register with those new users and purchase the Licence for each, or please get in contact with our sales team who would be happy to deal with your request in one transaction. Can I use market dojo as a mini eProcurement system? If you buy a Full Licence you can create as many Events as you desire.The current software lets you electronically manage the process, obtain initial bids and then move forward with an Online Negotiation Event. However, you can choose to negotiate offline and not move forward with an actual auction if you decide it is not the right course of action after you obtain the initial bids.Thus you can use the market dojo software with a Full Licence to manage all your tender activities electronically whether you go to auction or not, at no extra cost. The software will give you a one-stop shop for all you tender activities, keeping all the information and history in one place without the need for paper-based systems. Can I send out documents with my Event Invitation? What format of documents can I use? You can upload any format but be aware of the size restrictions and document security. What size documents can I use? The size limit for each document is 10MB (unless it is included in your invitation, in which case it is 5MB). Please speak to market dojo customer support if you need to upload larger documents. We would suggest that you PDF the documents where possible. This will not only reduce their size but also make the documents more secure. You can upload as many documents as required. Making the Online Negotiation Event a success is all about defining your specifications. This will make sure that everyone is bidding on even terms; that your Event will be more successful; that you will avoid issues like price creep after the Event; and that your participants will be willing to take part in future Events. However, this takes time and it is likely that you will have documentation to support your Event. These documents can be uploaded to the system either to be sent out with the invite or to be downloaded by the participants when you have given them access. The downloading of the documentation can also be tracked so you will have an understanding of the participant’s progress.Please see our ‘Host Process Guide’ and the ‘Request for Participation Template’ for some examples of the documentation to include. What back-up and security procedures do you have? Our host server provider uses a Self-Defending network which is built around Cisco ASA 5540 Series Adaptive Security Appliances, converging firewall, IPS, network anti-virus and VPN services. As a key component of their network, they provide proactive threat mitigation that stops attacks before they spread through the network, controls network activity and application traffic. Dual APC master switches are utilised in every server, ensuring consistent power without compromise. Full back-ups are made at the beginning of each day. Our site employs Declarative Authorisation procedures for the Username/Password login. We also use SSL Encryption of all data sent or received over the Internet. Please contact market dojo if you would like more information on this matter. Can I export my data out of market dojo? There is an export facility to download your results from market dojo into Excel. We can offer upgrades on the format and content of the reports, so please get in contact and we would be happy to discuss your needs. Can I stop participants from accessing my Event? At any point in the process, you retain control and can stop anyone from accessing your Event and documentation. Who has access to my Event, Lots and Documents? When the invite goes out to the participants, they will only have access to the Event Brief and the documents you have included in the invite. After they have accepted the invite or entered the Invite Code, you will see their registration details but they will still not have access to the Event. Only when you have accepted them to the Event can they see the documents, Lot and Event details. If you need specific information or a signed NDA back before giving acceptance, then these documents can be sent out with the invite.However there is a feature for automatically accepting the participants, for instance if you are re-running a previous event and are comfortable for all those participants to enter straight into the Event. This feature can make the Event more efficient but does not offer the same degree of restriction. When should I use market dojo? Good ‘Market Liquidity’: The more participants you involve in the activity, who are willing to participate and bid, the higher the chance of an interactive Event leading to the true market price. Clear ‘Definition’: Making sure you have the right specifications will not only make it a successful Event where everyone is bidding like-for-like but it will also ensure you are less likely to be subject to price creep during the course of the contract. High ‘Return on Investment’: These activities do take time and resource to complete. You would need to estimate the level of potential return against the resource required in order to validate your investment in Online Negotiation. Suitable ‘Scheduling’: You will need to have the possibility of awarding the final deal within reasonable timescales to embark on this Event in the first place. If current contracts are in place for instance then the category might not be suitable. Please see the guides on ‘How To Pick Your Category’ and the ‘Category Evaluation Questionnaire’ for more detail. How do I register with market dojo? Once you are completely comfortable with how market dojo works and what we offer you, please click on the “Sign Up” icon in the top right and complete the details. This does not cost you a penny, at least not until you wish to create and host an event. Even that is free until you reach the point of inviting participants. Once you are registered, you can enjoy the benefits of all our guides and video tutorials at no cost at all. How many Lots can I have? There is no limit to how many Lots you can have. We can offer an upgrade whereby you can upload the Lots automatically into the software if you have a large number of Lots. Please contact us if this would be of interest to you. Will I be informed of new opportunities? As our database grows, new Hosts will have the ability to see participants who have performed well in previous Events and may choose to include you in their Event. Thus market dojo could become a sales channel for your business, all at no cost to yourselves. What exactly am I bidding on? An Online Negotiation event will be made up of one or more Lots. Each Lot represents goods or services. The Lot will be made up of a Unit of Measure (UoM) and a quantity. You will be bidding on the UoM but you will need to take account of the quantity as this will feed into your pricing decisions. How can I be sure the Event is genuine and legitimate? Hosts need to pay to use the software. They would be unlikely to do this unless they are serious about the Online Negotiation Event. Hence you should take any invitation from market dojo as a real opportunity and give it your utmost consideration. Who should I contact during the Event? During any Online Negotiation Event, your point of contact should be the Host. market dojo can be your point of contact for technical issues relating to the software. Can I have direct contact with the Host? The first method of communication should be through our internal Online Message Board. The second method is to contact the Hosts through your own e-mail systems or via the phone. How and when should I log into market dojo? You can register and log into our system through the website. This will never cost you a penny. If you are involved in an Online Negotiation Event then you should log-in on a regular basis to check the Online Message Board, see if anything has changed or if you need to perform any actions. However, the software will also inform you by e-mail of any important changes made to the Event by the Host.